On the 8th of March, on International Women's Day, the USA Women's National Team (USWNT) did something very significant. A lawsuit was filed against their own Federation. The United States Soccer Federation (USSF) is being sued by all the 28 current members of the USWNT. US Soccer is being sued for years of "institutionalised gender discrimination". At face value, you understand it. The USWNT are reigning world champions. Their male counterparts didn't qualify for the 2018 FIFA World Cup, held in Russia. “Each of us is extremely proud to wear the United States jersey, and we also take seriously the responsibility that comes with that. We believe that fighting for gender equality in sports is a part of that responsibility. As players, we deserved to be paid equally for our work, regardless of our gender,” star striker Alex Morgan said in a statement. This is not the first time this is happening, from the USWNT, though. They filed a petition with the Equal Employment Opportunity Commission in 2016, to try and bring attention on the same issue - that they just weren't being recognised enough for what they did - something that the men are only a pale shadow of. In the 2016 wage discrimination case, it came to light that even per diems (daily allowances) were different for the USMNT and the USWNT. While the men were allowed $75 a day, it came down to $60 for the women. "Maybe it's because the women are smaller, and hence eat less," captain Carli Lloyd joked, at the time. While US Soccer has not responded to the current lawsuit that has been filed, it has been clear with its stance, that the pay disparity was a result of pre-agreed labour agreements. In a statement, US Soccer had said that while the men were paid more than the women, they were paid only if they were selected to represent the US National Team. 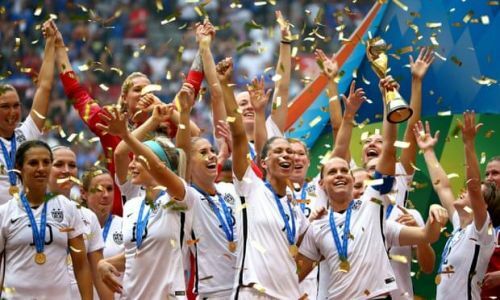 US Soccer said that even though the women had lesser pay, they were guaranteed the income, regardless of whether they were selected. US Soccer also said that the issue of bonuses for international tournaments was not an internal issue, because bonuses are set by FIFA, and not National Federations. The pay dispute was not limited to the players. After that 2016 case, it came to light that the USWNT coach Jill Ellis was paid lesser than the US Under-23 Men's Coach. Megan Rapinoe, one of the captains of the current USWNT said that the lawsuit was filed with the vision to a positive conclusion. Speaking to CBS, she said that US Soccer was "in a unique position to take an incredibly bold stance." "It's not something we're doing for ourselves, it's a change we want to bring about for women's sport as a whole," Morgan said while talking to CBS. The USWNT will still go into this summer's World Cup in France, as favourites. But with this lawsuit, they could achieve something more historic than adding to their record tally of World Cup wins in France. The USWNT might just have got started on the road to bringing female athletes' pay on par with the men.